Q&A: Do you have any new friends? I wouldn’t consider them friends yet, but we are choosing to spend more time together. Woke up and packed up to the smell of coffee. I sipped on it and burned my tongue more to add to the pain from last night while Caleb put the tent away. We drove over and up to Kennedy Meadows. I changed into hiking boots and my petite (their name, not mine) pants, that I haven’t worn in over four years. I parked us further than needed as we walked through the parking lot for this section of the trail. We walked easily to the bridge, passing an older guy and later a couple, to arrive to a couple washing their socks in the Kern River. We made it a bit further before Sparky began to slow down so we turned around (also to escape the climbing heat). I exchanged my green jacket for a white long-sleeved shirt and we only carried Sparky for a couple of minutes. We stopped at the General Store, complete with showers and a mini-bar with flat screen TV. I felt a bit out-of-place as the other hikers, coming down the 0.7 mile road to get here, were finishing the season, and us, only a few miles until the city couple showed up looking lost. We drove north for lunch, fuel, and a nap for the dog. We had pink cheese and parked on a small dirt path near Olivas Ranch Rd and started our hike by crossing a bridge over Lone Pine Creek with Sparky already walking behind me. “I don’t eat anything with a face” — other vegetarians, more eggs for me! We kept at it for 45 minutes and then the rain started to drip, drip.. with the threatening wall of torrential downpour approaching. I picked up Sparky and Caleb carried him the last five minutes to the car, which we were safely inside when the first rain started. We return to Fossil Falls and our spot from last night is taken so we park next to it, realizing how far apart the driving is but how close the sites are. There were only two other cars here last night, but we see at least five as we pull in. Caleb sets up the tent and I’m wishing for my rain coat or umbrella so we can walk around. The rain stops, as fast as it started, and we set out on a leisurely stroll thinking we have 90 minutes before it returns. It was only ten minutes before I was hustling through the bushes trying to keep up with the jackrabbit, though I think his speed was due to fear of me, not getting wet. Sparky is still sleeping in the car. I take off my muddy boots and wet shirt and hat. We settle in for a night of on and off rain, some from the east and west, with a side of double rainbows and thunder. I miss the bluer skies, smaller roads, abundant wildlife, and other perks without human obstruction. I appreciate my time here, every time. 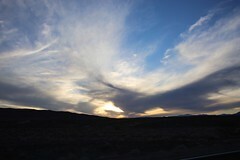 This entry was posted in Animals, Camping, Food, Hiking, Places, Travel, Water and tagged California, Fossil Falls, PCT. Bookmark the permalink.